I’ve found someone (actually, he found me!) who makes authentic old-style tied fishing flies. I’ve read references to the use of silk gut – WARNING: silkworm gut is exactly what it sounds like! in them, but no clear detailed information on how it’s actually put together. These are some photos of a fly-in-progress by Paul Martin. I made this for my new nephew. On the wise advice of a friend at work, I made another one in a coordinating color for my neice, so that there wouldn’t be issues about Who Got A Present. The yarn is called “Velvet Touch.” I got it from another knitter at a garage sale. 100% synthetic, but really, really soft, and washable. 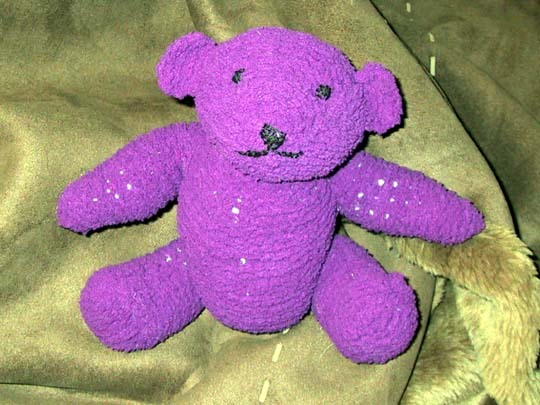 Pattern from Sandra Polley’s Knitted Teddy Bear Book. It’s Oscar – but doesn’t look like it in the face. 0 0 Michael Michael2005-11-26 17:36:002005-11-26 17:36:00Teddy bear! This is an account of a dream which has some graphic gay sexual elements. If that kind of thing bothers you, or if you’re not old enough to read it, please don’t click through.